In keeping with the firm's commitment to train and mentor our top-flight talent into the next generation of first-chair trial lawyers, Tucker Ellis launched the Tucker Ellis Trial Academy, a one-of-a-kind courtroom trial skills program. Our Trial Academy provides intensive, first-hand experience to the firm’s mid-level trial lawyers. The Trial Academy encompasses every part of a real case, from being hired by a client and agreeing upon a fee arrangement and plan, to working up the matter for trial, to finally trying the case to a jury. Integral to becoming a successful trial lawyer is the development of not only the skills to research, write briefs, take depositions, and argue motions in court, but also the nuts and bolts of taking a set of facts and developing a winning case strategy in accordance with client expectations – whether representing an individual plaintiff or defending a corporation – as well as presenting that story at the actual trial of the matter to a jury. Our Trial Academy provides comprehensive, hands-on experience to ensure that our next generation is prepared with the skills needed to serve our clients best. Teams of two trial lawyers each handle a dispute from start to finish. With some teams acting as plaintiffs' counsel and others as defense counsel, our lawyers do everything from filing the complaint to being retained by one of the four in-house counsel of our clients who participate as the defendant General Counsel. Just as if it were a real case, the parties check for conflicts and open case files; attend case management conferences with the court; engage in written discovery; prepare and take depositions of lay witnesses, corporate representatives, and experts; develop strategies for prosecuting/defending the case; and prepare the case for a jury trial to be conducted in the coming months. Senior Tucker Ellis trial lawyers serve as "Special Masters," providing the teams constructive feedback on everything from case strategy to handling witnesses at deposition or in the courtroom. The unique training, mentoring, and real-life client involvement that the Tucker Ellis Trial Academy provides is unlike anything available in our legal community as we strive to give our clients a different and better experience than they would receive from any other law firm. 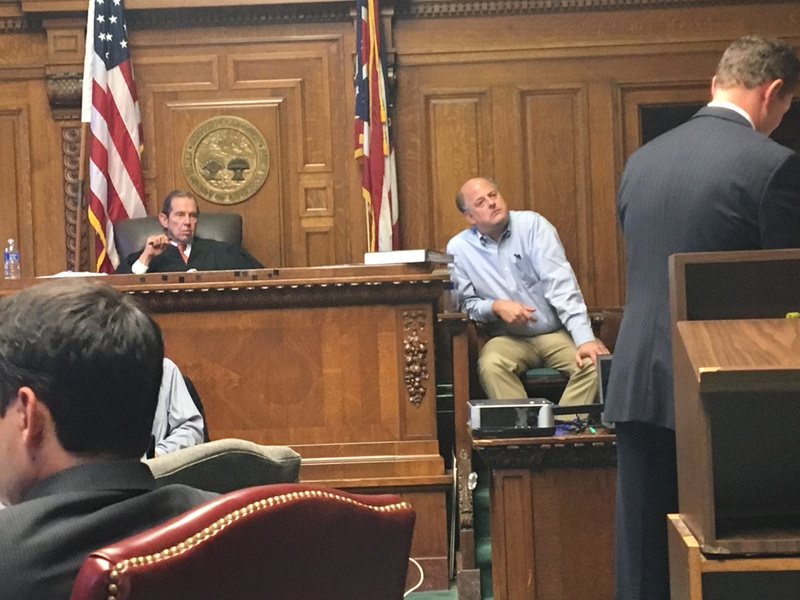 Pictured left to right: Bob Tucker acts as Judge for the 2016 Trial Academy while witness Jonathan Cooper is cross-examined by Chris Caryl.